With just 176 calories, no saturated fats and 2.5 grams of fiber in a small oat bran bagel, this healthy for you as a diabetic or non diabetic. However, it is recommended that you consume whole grain bagels and not ones that have been artificially processed. 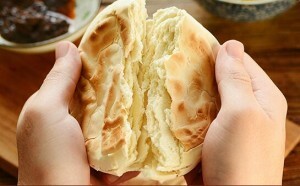 Bagel being starch it should be taken together with proteins, non-starchy vegetables and healthy fruits. Diabetics should stick to a diet that reduce the risk of contracting cancer, heart diseases and manage weight. It should contain all the essential nutrients including fiber and less of sodium and saturated fats. In terms of nutrients and fiber whole grains carries the day compared to refined grains. Some of the nutrients found in whole grains and not in refined grains are vitamins B, fatty acids and phytochemicals. However, don’t consume too much of it due to the simple fact that whole grains bagels are rich in carbohydrates. In your dietary plan, count consuming bagels as a starch food. In order to ensure that there is no sudden spike in the blood sugar levels you should ensure that you eat a balanced diet. A balanced breakfast should contain, quarter fruit, quarter protein and half starch foods as recommended by ADA. Whole grain bagel being rich in starch firsts perfectly in this dietary plan as long as you eat it with other health fruits and proteins such as fresh blueberries that are stirred into a low- fat cheese. You can also apply almond butter on your bagel then add a few slices of fresh banana. A fresh bagel sandwich will make a healthy option for either dinner or lunch. To make it a balanced diet you can to it with skinless turkey breasts to add proteins and any vegetable that is not rich in starch. Examples of such a vegetable include romaine, arugula, onions, baby spinach, red paper celery or cucumber. Other than using mayonnaise as a flavor use black pepper since it doesn’t contain saturated fats and doesn’t add in calories. If you are diabetic and extra cautious about your blood sugar levels you should consider consuming whole grains and not refined grains. If you have to choose go for whole grains that are derived from whole wheat flour since they are rich in nutrients that you can’t get in any other whole grain bagel. Some of these nutrients are fatty acids, phytochemicals and vitamins. All these nutrients play a major role in helping the body manage the blood sugar levels. Bagels being rich in starch should be consumed together with other healthy foods to make it a balanced diet. 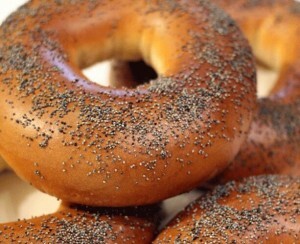 Some of the foods that are healthy to consume with bagels are vegetables, fruits and other foods rich in proteins. Only consume a small portion of it. A healthy dinner and lunch should contain ½ non-starchy vegetables, ¼ starch and ¼ proteins. A healthy breakfast should contain ½ starchy foods, ¼ fresh fruits and ¼ proteins. This means that you can include whole grain bagels in just any meal. Mix eggs, butter, coconut oil spices in a preheated oven. On the other hand mix baking powder, whey protein and coconut separately. The two separate mixtures should be blended in for approximately 15-20 minutes. The end product is a low carbohydrate bagel. This is not the only way in which you can make bagel that is low in carbs, there are other ways. Be careful on the ingredients you use and they should be accounted for in your dietary plan. The fact that whole grain bagels are rich in protein doesn’t mean that this should be your only source of starch. You should include starch from other sources as well. Healthy options include starchy vegetables and legumes. Other sources include corn, green peas, beans, brown rice, lentils, parsnip, wild rice, plantains and butternut. If you have had previous complication or under other medications kindly consult your doctor!